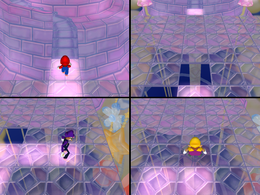 Memory Lane is a 4-player minigame in Mario Party 6. Its name comes from the metaphor for reflecting on one's memories: "taking a trip down Memory Lane". This minigame has day and night variations of it, though they are purely aesthetic. 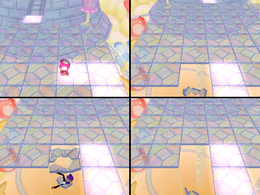 A Shy Guy walks across the glass platform on a random path, turning at various points. The player must walk on the exact path that the Shy Guy did during the introduction. If the player steps on the wrong section, that piece of the floor crumbles, and Lakitu has to pull them back up. The first one to reach the castle on the other side wins. The path Shy Guy walks is different every time the minigame is played. The winner is standing atop the castle at the end of the path with Shy Guy, who is cheering as the winner does their victory animation. Rules – "Follow the Shy Guys' route across the floor to the goal. Whoever reaches the goal first wins!" Advice – "The Shy Guy will only walk across once, so pay attention and memorize his path!" This page was last edited on January 16, 2018, at 13:05.